In the midst of the season’s hustle and bustle, it’s important for me to pause for moments of rest and refreshment. To soak in the treasure of this time of year, to enjoy a cup of coffee with a friend or to sit by the fire with a good book gives me perspective and room to breath. That’s why I loved the article over at Lark and Bloom on Breathing. Take a minute in your day to read and be refreshed. This meal is a pause and a break for me. A tangy, flavor mix up from normal holiday foods. Don’t get me wrong, I love garlicky spiced crackers and hot chocolate and sugar cookies, but mid week between Christmas parties and dinners, I’m craving something fresh, healthy and bright. Plus I find that I feel a lot better about eating an extra dark chocolate truffle at a party if I’ve been eating healthy during the week. My favorite flavor profile is definitely Mediterranean. How can you go wrong with lemons and garlic and olive oil? After college and before marriage, I lived with some dear family friends. Every Thursday I cooked dinner for them and upon entering the kitchen their oldest, Hudson, would always ask: “Jill, is there garlic in this?” The answer was always yes. Hey, it’s heart healthy! 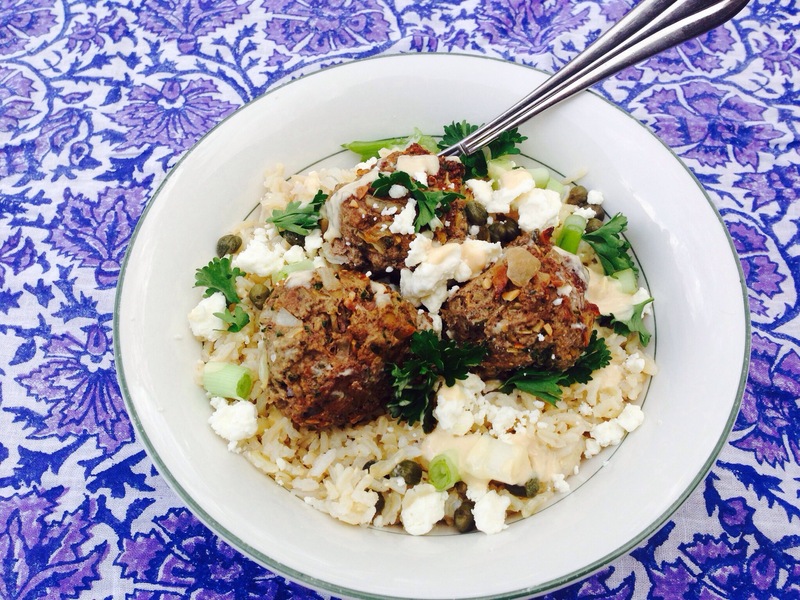 I used toasted pumpkin seeds in the meatballs instead of pine nuts as the original recipe called for. I love pumpkin seeds because they are inexpensive but pack the same deep, nutty flavor. The leftovers are great stuffed into pita bread or covered in hummus. I hope you try this and enjoy it; afterwards make a cup of Nutella Hot Chocolate to keep you in the Christmas spirit. Cook brown rice according to package directions. This takes about 40 minutes, so make sure to plan ahead! Using your hands mix together ground beef, chopped onion, 2 cloves minced garlic, pumpkin seeds, all spice, salt and pepper in a bowl. Shape meat into round balls, pressing together so it is compact and keeps its shape. Place on a plate and chill until you are ready to cook them. Preheat oven to 425 degrees. In a medium bowl, whisk together the tahini paste, lemon juice, water, and 1/4 teaspoon salt. The sauce should be a bit runnier than honey; if needed, add one to two tablespoons of water. Heat olive oil in a large pan over high heat, sear the meatballs on each side to get a nice golden brown color, about 5 minutes. Do this in batches so the meatballs are cramped together. Place them on a baking sheet and put in the oven for 4 minutes. Remove meatballs from oven. 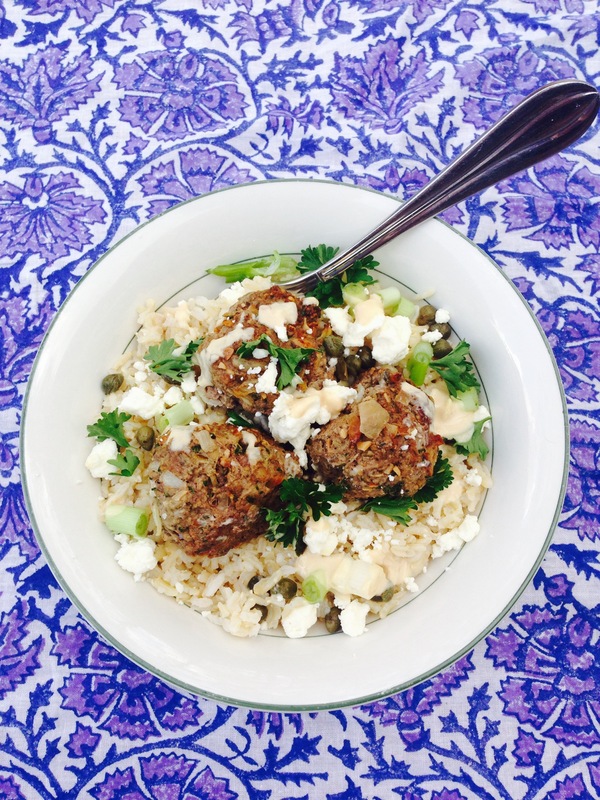 Serve over brown rice, drizzling tahini sauce over top and sprinkle with capers, feta cheese, chopped parsley and green onion. Serve immediately. Happiest 8 years with my husband. This year has been full with transitions and new life adventure and there’s no one I would rather take risks with! I’ve never felt more seen, more sought after, more thought of or more loved by anyone than by Matthew. 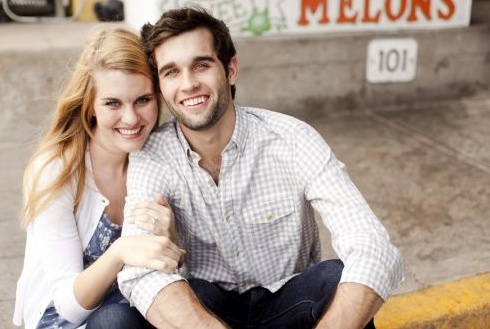 I’m overwhelmingly thankful to be his! !